BioWare has taken the wraps off a seven-page preview of Mass Effect Evolution, the upcoming comic book miniseries that looks at the early days of the Illusive Man and the Human-Turian conflict. 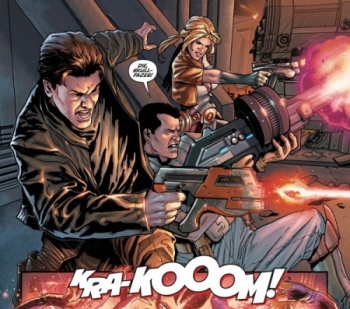 We first heard about Mass Effect Evolution in December 2010, when BioWare announced that it had re-teamed with Dark Horse Comics to publish a four-issue story about the role the Illusive Man played in the brief, bloody war between Humans and Turians, and presumably the role that conflict played in turning him into the Illusive Man. The question at the time was, why is the younger, down-dressed I-Man sticking a gun in the face of a helpless Turian? Now we have an answer. Turns out that he was on Shanxi when the Turians showed up to explain how dangerous it is to use mass effect relays without due care and consideration. He and his friends disagreed with the Turian position, however, so with a hearty "DIE SKULL FACES," a KRA-KOOOM! and a KRCHOWWW! they had at the alien invaders. What happens next is anybody's guess at this point, because BioWare has only seen fit to give us a seven-page preview of the first issue. Will the Illusive Man prevail? Will Shanxi be rescued? Will humanity be crushed under the Turian bootheel? Yes, yes and no; that's the trouble with prequel material, it doesn't really matter what happens because you know how it's all going to work out in the end. But for die-hard Mass Effect fans interested in learning what makes the Illusive Man tick, this might be just the ticket. Get a taste of what's coming at the BioWare Blog and then get in line at your local comic shop on January 19.